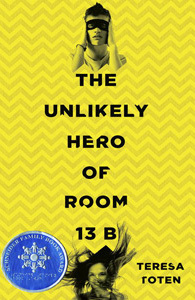 The boy inhaled as the door opened. It was as if he knew. The girl stepped into the room, and within the space of a heart­beat, he was lost. The girl made her way towards the semicircle of chairs, not smiling exactly, but not hesitating either. She was older for sure. Probably. So it was hopeless, of course. She sat down directly across from him, at her end of the semicircle. Without looking up, she crossed her genius, perfect legs and flipped a long black braid behind her. By the time he exhaled, the boy was in love. It was like he had drowned in a wave of want. Without even knowing how he knew, he somehow did know that if she wanted, he would give the girl everything. Hers for the taking as of that moment were his iPad 3 (especially since he himself was no longer allowed to use it), his first-edition copy of J.D. Salinger’s Nine Stories, his Xbox, his autographed Doc Halladay baseball and his most prized Orcs from the Warhammer Fantasy Battle game—the classic eighth edition, not the other poseur stuff. For her he would master his most troublesome ritu­als and offer up what was left of his sanity. “Greetings, Robyn, and welcome!” said Dr. Chuck Mutinda, nodding first at her and then into a raggedy file folder. This simul­taneously shattered and enhanced the moment. The boy now knew her name. “Thank you,” the girl said to her feet, and the boy stopped breathing altogether, so hypnotic was the sound of her voice. The girl’s eyes were blue. Up until that very second, the boy had never noticed the colour of anyone’s eyes, could not have told you the colour of his mother’s eyes. But Robyn’s eyes . . . well, they were the shade of an angry sky rimmed by thick lashes the colour of soot. Her beauty—which, shockingly, no one in the room felt compelled to jump up and comment on—was ravish­ing. Everything in him felt tossed and trampled. He ached deep inside just looking at her, but he could not look away. So this was what that was like? Residential. His heart stopped then started up again. He focused on his breath the way Chuck had tried to teach him to do—except that he’d never really paid attention, so it didn’t help. Residential. They were all freaked by the mere possibility of residential. “Yeah, man, what’s with that? I spent half an hour riding the damn elevator my first time here. I thought it was some psycho test,” said Peter Kolchak, slouching into his chair. A couple of the kids snorted in agreement. Sixteen! The boy seized on the number. Sixteen was bad. It was an even number, and therefore had to be sterilized. And it was very bad as an age. Sixteen—he repeated it fifteen times and tapped it out thirty-three times until it felt “just right.” Okay, so it could have been worse. And then he realized it was. There was also the height thing. You could tell even when she was sitting. The height—her height—could be and certainly would be a barrier. Robyn was unusually tall for a sixteen-year-old goddess, and he, sadly, irrefutably, was quite short for a boy of almost fifteen. Too young, too short—definitely obstacles. But these too were surmountable. The boy would grow, and fast, now that he had a goal. He’d just never had a goal before, not really, or at least not one that he could remember. He would start right away, immediately, this instant. The boy began listing his brand-new goals as Chuck intro­duced everyone to Robyn. He wrote them in bullet points with his right index finger into the shielded palm of his left hand. The boy straightened up hard into his chair. The chewed-up plastic bit into his shoulder blades. It was almost his turn. “Pretty Boy Ross,” said Peter, who had been providing a run­ning commentary throughout Chuck’s intros. Peter was sitting beside Robyn and facing her all the while, moving ever so slightly closer. Pretty? What the hell? Peter was going to be a problem. Or maybe he just needed a meds adjustment. With some in the group it was hard to tell. Did he actually say that? Between Chuck and Peter, Adam sounded like the group’s pet bunny. Elizabeth was only a few months older, for God’s sake! Chuck had said the same stuff last week during the first round of intros. Somehow, it hadn’t sounded as gormless then. Adam would normally tap or count the tiles, but since, as of seven minutes ago, he was a man with a goal, he didn’t. Besides, they were all looking at him. So Adam Spencer Ross rolled dice he didn’t even know he possessed. He sat up straighter and presented Robyn with his finest “Whaddya gonna do?” smile. His feet got hot. Robyn had not smiled back at the others—who, he had already determined last week, were way more nuts than he was. Adam had tracked her reaction to each intro as he’d listed his newly revised life goals. With years of multi-tasking of a very high order behind him, he could tap, count and pay attention to critical information. That’s it! Game over! Confirmed as dead-in-the-water! Grade 11 was deep into high school. It was practically out of high school! Juniors dated college boys, sometimes. Even he knew that. Peter Kolchak, who was still ogling her, was in college, or would have been if he hadn’t flamed out. Adam was in grade 10. This was Montague and Capulet territory. That he was in the gifted program at St. Mary’s was no bonus. He got angry with his mother all over again. She had point-blank refused to let him skip from grade 3 to grade 4, even though the nuns had suggested it rather strongly (for nuns, that is). He and Robyn would have been in the exact same year if it weren’t for his mother. Adam tapped his right foot twenty-nine times in three sets ending with three middle-finger taps for good measure. It was barely perceptible even in this room of experts. The annoyance with his mother receded. She meant well and he did love her, after all, whatever colour her eyes were. Robyn folded her hands neatly in her lap. They jutted out of a forest green school blazer. The uniform jacket was too small and the school kilt too short. This was more about neglect than an effort to look cool. Adam would swear to it. Except for shiny perfect lips, her brilliant face shone without a trace of makeup, but bright blue nail polish gleamed on every fingernail. Ten little rob­in’s eggs. Robyn’s eggs. He knew with impenetrable certainty that this was the reason she had chosen that colour. He got it. It was yet another reason, in the head-spinningly fast accumulation of rea­sons, why they should be together, forever. Chuck was in serious overdrive in his signature laid-back kind of way. He was going around the room again. There was muttering. Chuck looked like he didn’t care one way or the other. But Adam knew better. He’d already been going to one-on-one ther­apy for almost a year before Chuck suggested that it was time to join the group. Dr. Charles Mutinda cared plenty. Chuck had asked everyone to pick a nom de guerre, as he called it, for this and all future sessions. They would leave their doubt-ridden, shell-shocked and agonizing selves at the door and become instead all-powerful beings. Adam got excited despite himself. He would cease to be, becoming the Venerable Lord Kroak or Grimgor Ironhide! Yes! Why not? But by the third pick a clear trend was forming: except for Elizabeth Mendoza, who claimed a reality TV star named Snooki, the rest of them called in comic superheroes. In fact, the group was loosely forming into either DC’s Justice League or Marvel’s Avengers, with just a hint of X-Men. Connie Brenner chose Wonder Woman, lining up in the Justice League camp, while Peter Kolchak called in Wolverine. Kyle Gallagher said he wanted to be Iron Man, while Tyrone Cappell said he’d like to be Green Lantern if that was all right with everyone. “Oh. Right, yeah. Cool. Whatever,” said Wolverine. The storm cloud growled his assent. Adam smiled at the Viking like an idiot. He couldn’t help it. “Hey, man, Thor’s the best!” The newly anointed Viking glared at him. Didn’t matter. Adam loved the anguished Thor comics. He had a million copies perfectly stacked in order of issue in his closet. Nicolas Redmond was a perfect Thor. “Robyn,” she whispered. “If you don’t mind, I choose Robin. Not my name but like the . . . well, you know.” Each consonant and vowel shimmered with pain. And even though he had never noticed girls before, not at all—okay a bit and sort of, but not really—Adam knew he had to save her, must save her, or die trying. He loved her deeply, wildly and more intensely than he would have believed possible even minutes ago. Robyn, his Robyn, needed someone larger than life—a victor, a knight—and he would be it. For her, Adam would be and could be normal and fearless. He so wanted to be fearless. He could do it. He would be her superhero. They were all looking at him now, including Thor and Robyn. Her smile sweetened, Adam was sure of that too. He felt himself grow. It all made perfect sense. The universe was unfolding exactly as it should. “Batman,” he said in a strong, clear voice. Adam Spencer Ross would be her Batman. 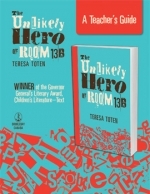 Excerpted from The Unlikely Hero of Room 13B by Teresa Toten. 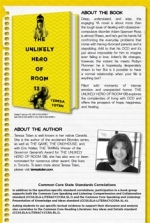 Copyright © 2013 by Teresa Toten. 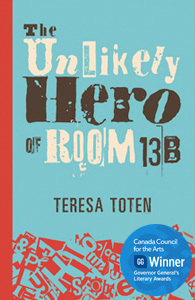 Excerpted by permission of Doubleday Canada. No part of this excerpt may be reproduced or reprinted without permission in writing from the publisher.